Using our cutting-edge photogrammetry tools and algorithms we help you to efficiently process, interpret, manage, and share spatial data from different sources. By applying professional algorithms, we can process stereo pairs of aerial photos and generate surface point cloud and metric 3D model of the surface you are interested in. Photogrammetric procedures enable us to obtain a high-density point cloud that can exceed 100 points/m2 in areas where the texture of the surface is well defined. The density of the point cloud can be adapted to suit your requirements. In addition to spatial coordinates (x, y, z), each point contains the information on its colour as seen in nature. 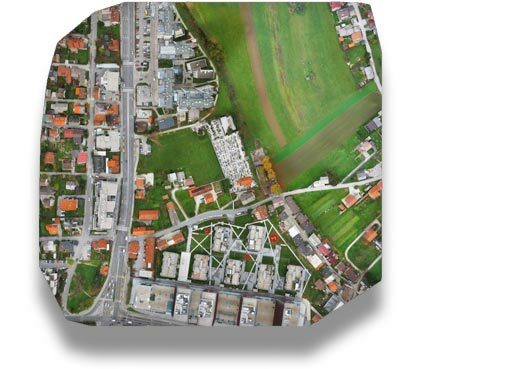 By applying classification procedures and filtering, it is possible to distinguish points in the model that denote buildings, vegetation, terrain surface and other elements you would like depicted. By draping the planes over the point cloud with advanced algorithms, we can prepare a precise Digital Surface Model of the area of which aerial photos have been taken. The model obtained in this way represents an excellent basis for segmentation procedures which allow us to make various digital 2D and 3D models, e.g. Digital Terrain Model (DTM), Digital Elevation Model (DEM), Digital Building Model (DBM) etc., i.e. an optimal solution that corresponds to your needs and intended purpose. What is more, we will gladly provide you with any advice necessary. 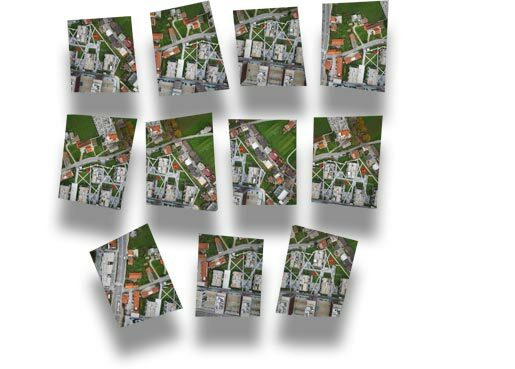 Simply put: high-quality aerial photos plus a Digital Surface Model equals an orthophoto mosaic. One single product thus combines the advantages of aerial photos (details, relevance of a piece of data at the time of it being captured etc.) and maps (uniform scale, accurate geometry). It can be used for a variety of purposes, e.g. as raster basis in geolocated spatial databases, surveying and mapping groundwork for the purposes of planning, realistic “pasting” on 3D models etc.